Artist: Alexander Steiger Dis ("Steiger"), Ukraine. Artist: Tim Millar ("crust"), UK. Artist: Adam Bartley ("Adam"), Norway. Here's a list of known places to buy a tafl game. 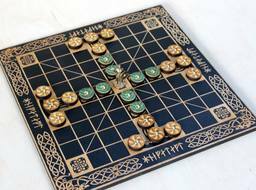 Although one should not forget that tafl is a simple game, and everybody can make a simple tafl set of their own. The commercial game sets, however, are often more artistic. Not all the internet sites listed have been checked for reliability. If you see some suspicious site on the list, please inform about it. Also please inform if you know of a site not on the list. 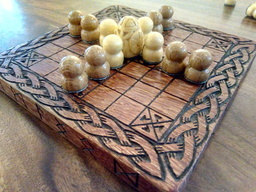 Many museum shops sell tafl games. Often museum shops also sell through the internet. and in the photo collection of our Facebook site. 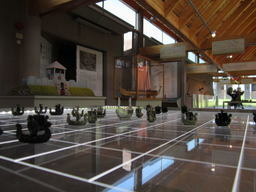 Bear in mind that a game can be made very simple and has not to be as imaginative as in the photos.